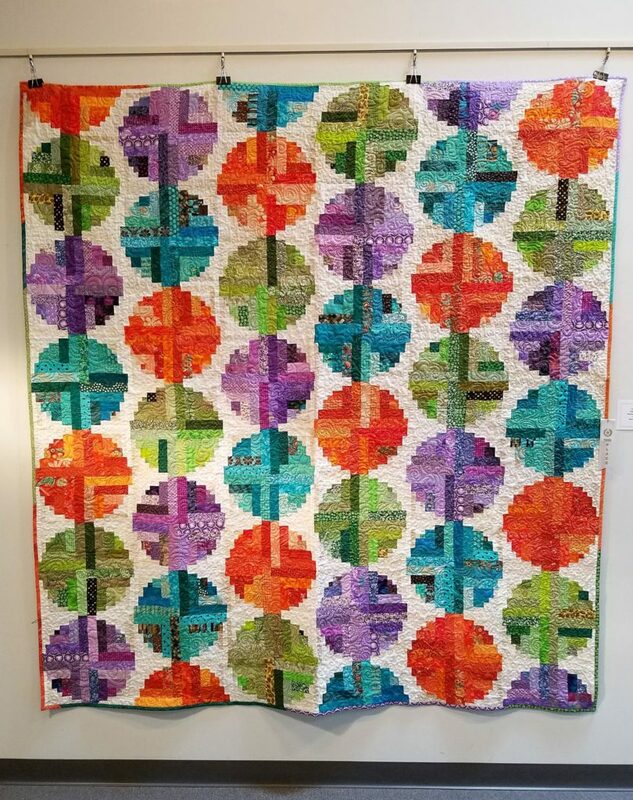 January in Southern, MO started off pleasant and sunny for wintertime but turned a little colder (and more treacherous) just in time for the opening of our 2019 Textile & Quilt Show at the museum. Opening weekend, we had inclement winter weather (read: ice) in our forecast, forcing us to close the museum Friday & Saturday, Jan. 11th & 12th, and to postpone our very first Gala Night @ the Museum for the 2019 season, which was to feature a “Bed Turning” demonstration to compliment the show. However, as the saying goes – the show must go on! Although the weather affected our number of visitors for the show’s opening, it didn’t affect the number of entries we received for the exhibit’s display. 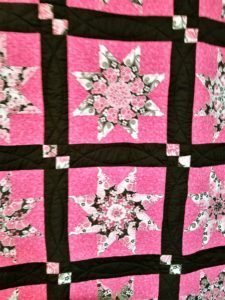 Boasting a full gallery of locally-created pieces of textile art and original quilts, our first show of the year is a dazzling display of creativity in this most-beloved Ozark art form. 2019 Best of Show winner by Alma Pruett of Cabool, MO. 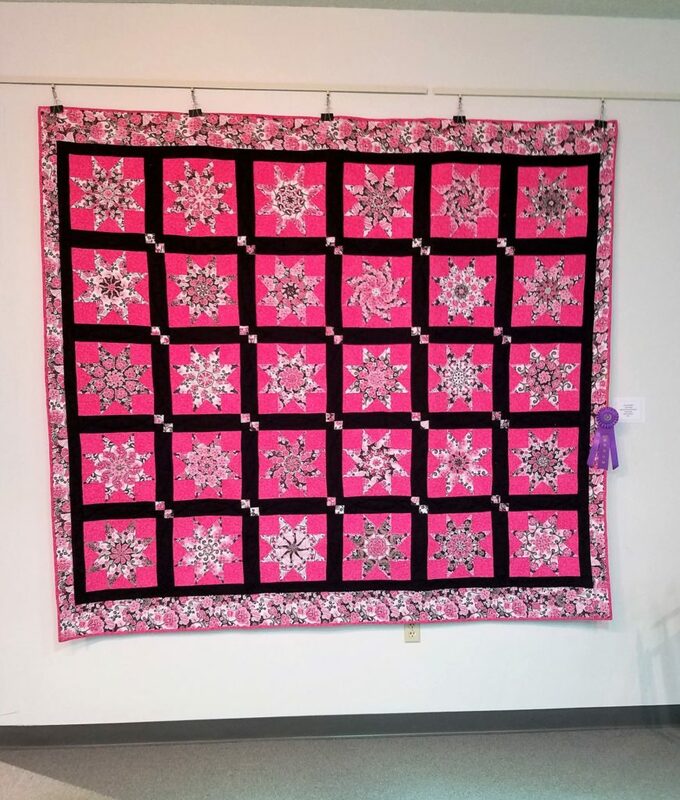 The Best In Show prize was awarded to Alma Pruett of Cabool, MO for her entry, “Stack & Wack”, a lovely and bright pink cotton quilt which was created using the quilting method of the same name, which you can read more about here. 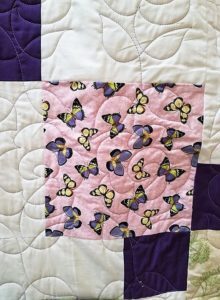 The quilt was both pieced together and quilted by machine. The 2019 blue ribbon 1st place winner by Linda Ramsey of Houston, MO. 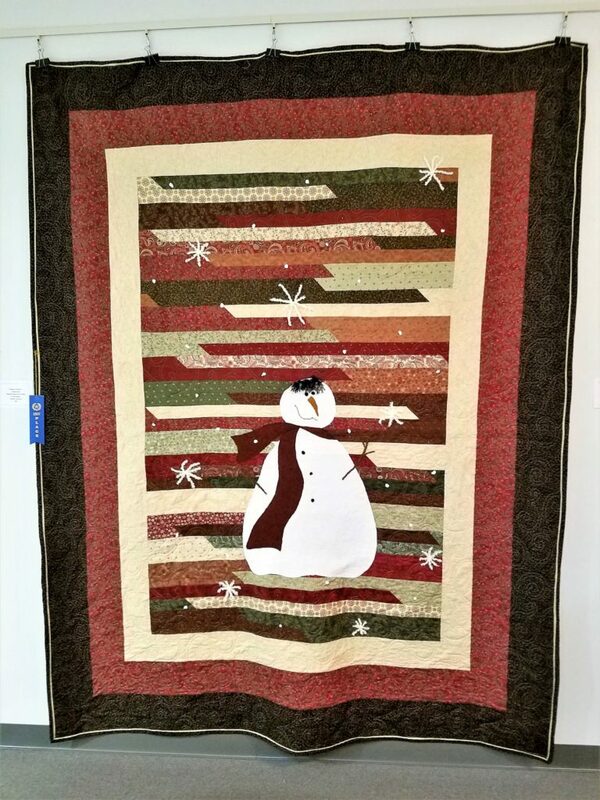 Our 1st place blue ribbon was awarded to quilter Linda Ramsey of Houston, MO for her entry, “Dreams of Winter”, a machine pieced and quilted strip-style quilt with an appliqued snowman figure. 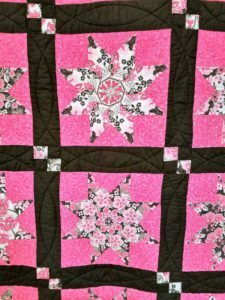 You can learn more about the strip-quilting method here. Alma Pruett of Cabool, MO placed a second time this year (2019) with this red ribbon 2nd place quilt. 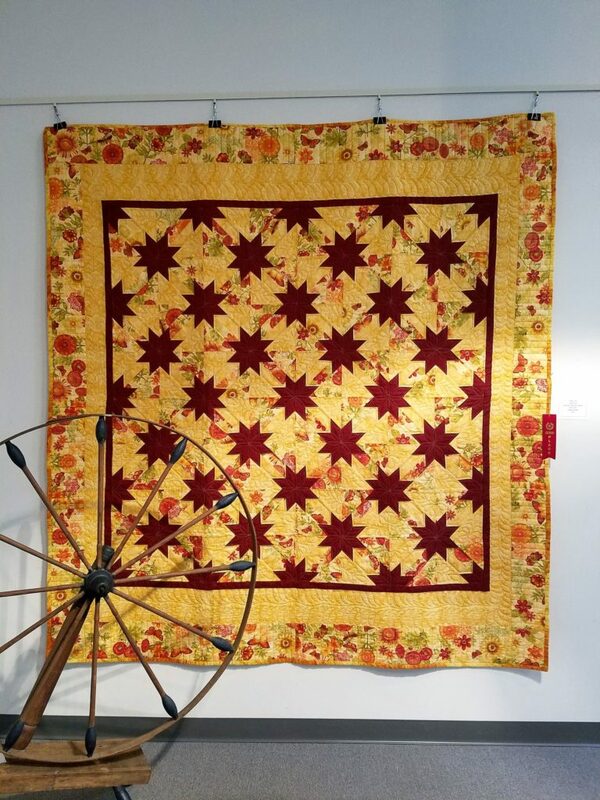 The 2nd place entry, “Hunter Star”, another creation by Alma Pruett of Cabool, MO, is a rich burgundy & gold featuring the popular eight-pointed star style pattern of the same name. To learn more about creating your own Hunter’s Star-style quilt, you can follow our link here. 3rd place was awarded to Shirley Earls of West Plains, MO for her entry, “Log Cabin Dots” a lovely multicolor quilt using the log cabin technique to create the dotted pattern on the quilt. You can learn the basics of this technique here. 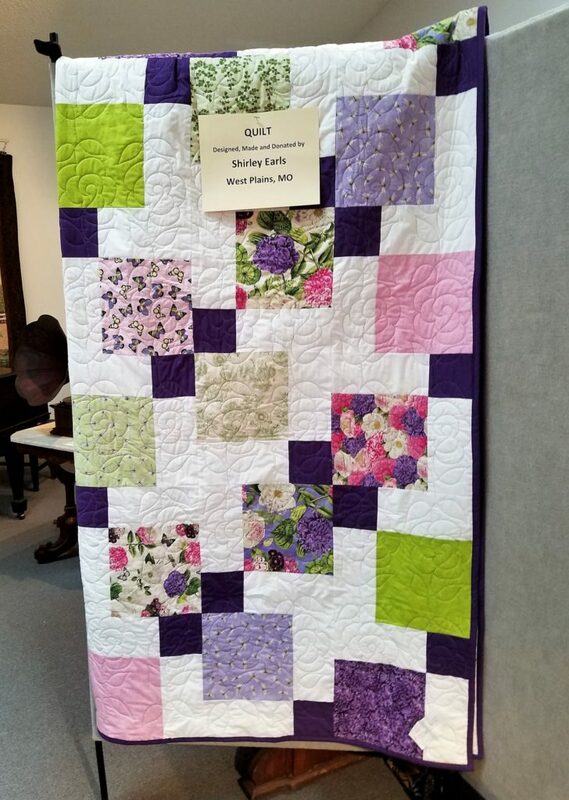 Shirley also donated a second patchwork quilt in hues of purple, pink, and green against a white background for the museum to give away as the prize in a fundraising quilt raffle. Tickets to enter the raffle are 1 – $1.00, 6 – $5.00, an arm’s length of tickets (so be sure to send someone with long arms to get your tickets!) – $10.00, and enough tickets to stretch from fingertip to fingertip (again, send those long-armed people to get your tickets for the most chances!) for $20.00. 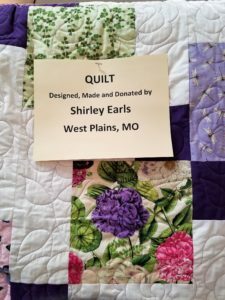 2019 Quilt Raffle Donation from Shirley Earls, West Plains, MO. The winning ticket will be drawn on Valentine’s Day, Thursday, February 14th, 2019. 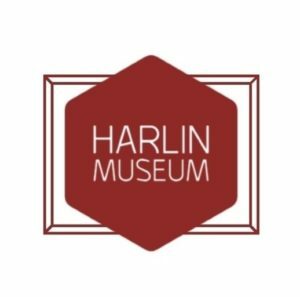 All proceeds will be used for the wintertime utilities & ongoing maintenance of the Harlin Museum. You can visit the fundraiser page on Facebook here. Honorable Mention awarded to Alma Martin of Mountain Home, AR. Two Honorable Mentions were also given out for this show; the first, to Alma Martin of Mtn. 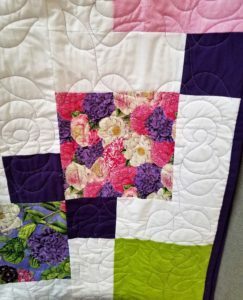 Home for her freestyle design quilt, “Springtime in Bloom” which features a centered house design & rows of brightly-colored two-pointed tulips. 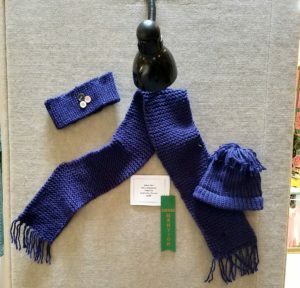 The second Honorable Mention ribbon was awarded to Cindy Pirch of Summersville, MO for her knitted entry, “Button Blue”, a matching royal blue set of knit scarf, hat, and headband. Along with all the individual entries, the exhibit in the gallery also includes interesting antique sewing implements, including an antique wooden spinning wheel from the museum’s permanent collection, along with other heirloom quilt tops and crocheted pieces, antique sewing accessories, and antique quilts & coverlets. Be sure to stop by before the exhibit closes! 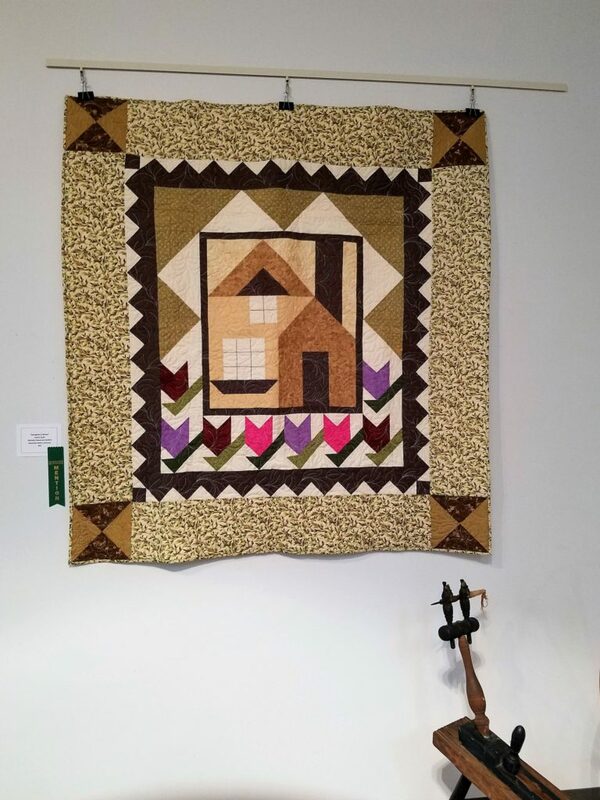 The Quilt & Textile Show will be displayed in the Hathcock Gallery of the museum until the Artist’s Awards Reception at 2pm on January 26th. All winners are encouraged to attend so that they may be awarded their ribbons & accompanying prizes, as well as having their photo taken for our official record of the event. The museum is open Thursday & Friday, 12pm-6pm and Saturday & Sunday, 12pm-4pm.